The Worcester City Council meets Tuesday at 7pm. The agenda is here. This week’s agenda includes the sale of Mosaic’s building and a desire for city surveillance drones. If you know of anyone else who’d like to get our weekly preview via email, the link is here. Solar Roadways: Sergio Bacelis, Jr. has a citizen petition asking the city to contact the company Solar Roadways about them doing a pilot program in Worcester. I am no solar engineer, but this seems like a terrible idea. Youth Center Safety: Charles Luster has a citizen petition asking the City Manager to “review the operations of the After-School Program of the Worcester Youth Center to guarantee the safety and well-being of young participants.” I don’t know what prompted this. Merging the School Department: Councilor Rosen has an item asking about the feasibility of “having the city administration absorb the personnel, purchasing and clerk responsibilities of the school department.” This item has come up many times only to be shot down. The schools have three times the personnel of the city administration, and the administration already does purchasing for the schools. So it is a bit of an odd proposal. Recycling Pickup: Councilor Economou has an item asking the Commissioner of Public Works and Parks to look into the job our recycling pickup vendor is doing. You may recall that awhile back there was an attempt to do a pilot program wherein people could put their recycling in clear trash bags rather than bins; no idea how that is doing. Seems like that would solve the main issue with pickup, trash strewn everywhere. Cap on Charter Schools: Councilor Mero-Carlson has an item asking the Council go on record as supporting the current cap (limit) on charter schools. Governor Baker has proposed a bill raising the cap, and that there is a proposed ballot question that would also raise it. Last month the Worcester School Committee passed a pro-cap motion unanimously (eventually; on the first round, Colorio was opposed). These votes come in direct response to requests from the legislative delegation that local government weigh in on the impact of charter schools. 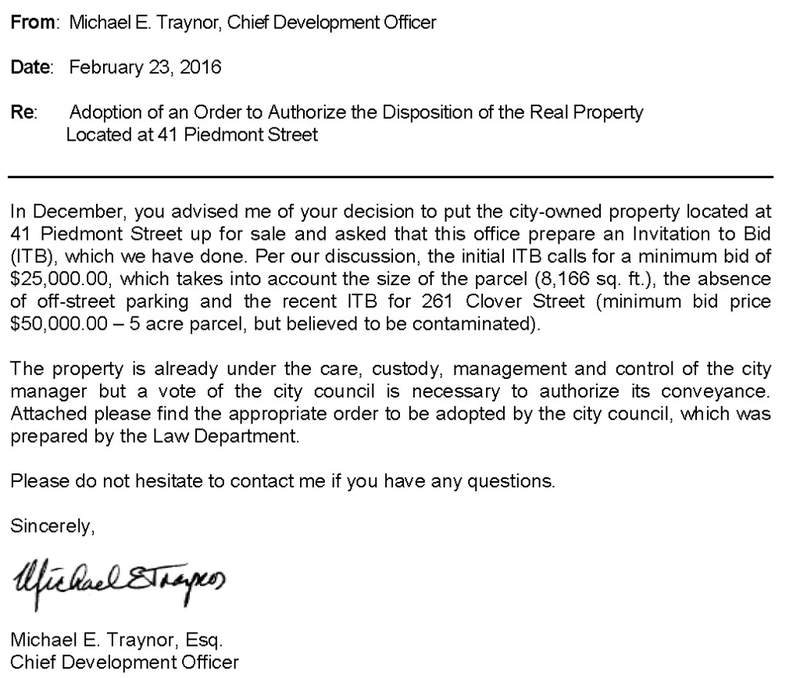 American Legion Re-zoning: This item keeps getting held, and may get held again. The American Legion building at 1023 Main St has been sold and the new owner would like consistent zoning across the property (the parking lot is “residential”). The Planning Board approved this, but some councilors would like more feedback from the neighbors before approving it. 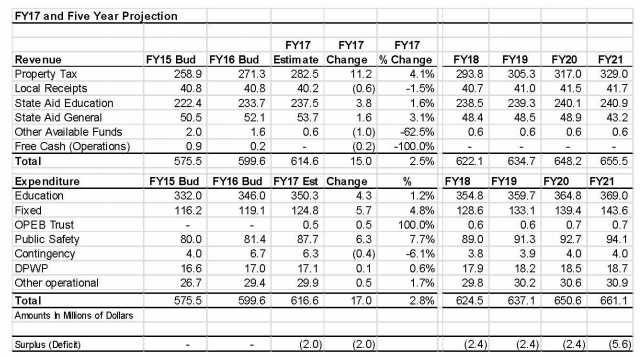 Five-Year Financial Forecast: (Held over from previous meeting.) The City Manager has a report on what he expects the city’s finances to look like over the next five years. A key chart is below. Six-Figure Finance Items: $335,000.00 transferred from Sewer Drainage loan account to DPW Surface Drainage account to allow for the payment of current and future obligations; $339,110.00 from Capital Equipment loan account to DPW Capital Equipment account to allow for purchase and future payment of two sanitation vehicles; Improving Criminal Justice Grant to Encourage Arrest from the US Department of Justice for $450,000.00; Community Compact Information Technology grant from the Commonwealth of Massachusetts for $400,000.00.